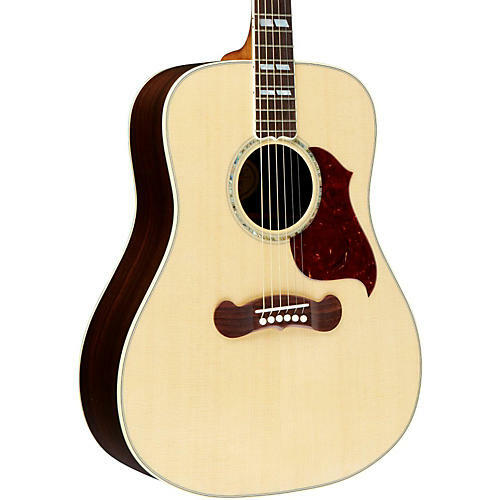 Gibson's modern rosewood dreadnought with a superior dynamic range. At the heart of Gibson's square-shoulder dreadnought line is the Songwriter Deluxe Studio. First introduced in 2003, the Songwriter combines Gibson's time-honored bracing patterns of the 1930s with Gibson's original dreadnought shape, providing a supreme tonal quality. Stage and studio ready with rib-mounted, high-performance electronics unit. Other features on this upgraded version include a 2016 engraved truss rod cover, improved feel thanks to the softened fingerboard edge which makes it a more comfortable fit in the contour your hand, an enhanced finish thanks to finer grit sandpaper and polishing compounds used on its high gloss finish, and smoother hand rubbed and oiled fingerboard and bridges which will make them last longer and maximizes the wood's natural vibrancy. Finally, the Songwriter Progressive utilizes state-of-the-art German-engineered Plek technology to create the finest playing surface possible which has also been hand finished for the finest feel and playability. Order this modern take on a classic Gibson today. Includes hardshell case.